October 16, 2013 – Milford, NH – The Earthworks 521 ZDT Preamps for 500 series racks, are now in stock and shipping. Based on the ZDT Preamp technology designed by David Blackmer, the Earthworks 521 brings the exacting standards of the ZDT Zero Distortion Preamplifiers™ to the convenient 500 series format, providing a pristine amplification option to the 500 series rack. 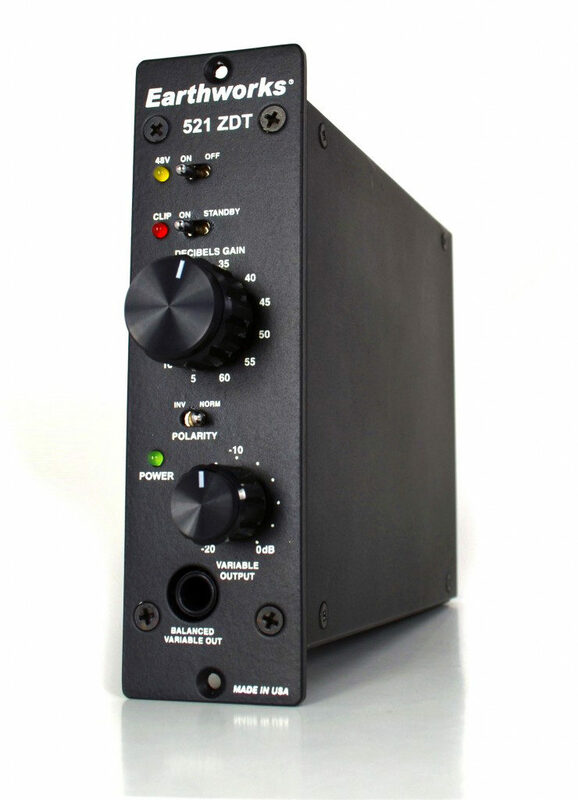 The solid state 521 features switchable phantom power, polarity invert, and peak amplitude clip detection, just as in the original ZDT Zero Distortion Preamplifiers™. The transformerless output stage of the 521 will easily drive long cable runs without loss of quality. Transparent gain is switchable from 5dB to 60dB in 5dB steps. The Earthworks microphone preamplifier topology provides outstanding common mode rejection, excellent overload margin and an incredibly low noise floor, combined with the ultra-wide bandwidth of the ZDT Preamps (1Hz to 200kHz ±0.5dB) and distortion of less than 1 part per million (0.0001%). This exceptional level of performance is maintained over an extensive range of impedances applied to the input, making the 521 suitable for practically any microphone – ribbon, dynamic or condenser. The Earthworks 521 has a MAP of $999. The Earthworks 521, along with the rest of the Earthworks product lineup, will be at The 135th AES Convention at the Javits Center in New York, October 18-20, Booth #2739.